The Newsletters are open to all members for contribution of articles, pictures, news, or anything else that would be of general club interest. Please call or email the editor for all comments, requests, or submissions. Editor contact information can be found inside the first page of each newsletter. 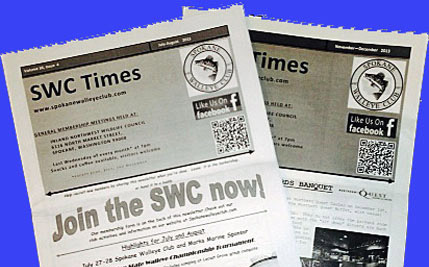 Club newsletters can be delivered to members by mail or by email in PDF. Links to current and past newsletters are found below. As they are in PDF, they require you to have Adobe Reader installed on your computer in order to read these files. Adobe Reader is a free program available at the Adobe website.